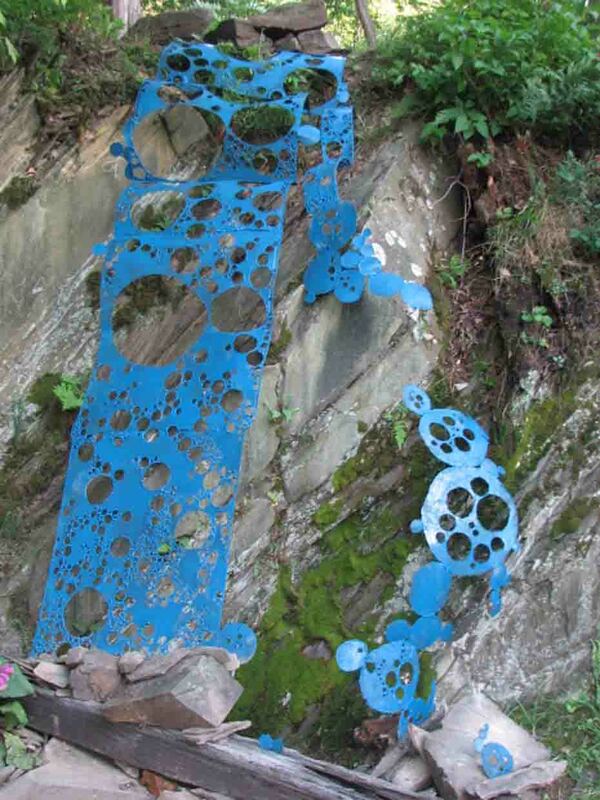 Ezra Silverman is a visual artist with a focus on sculpture. He is trained in traditional sculpture, mold-making, welding, and has a foundation in portraiture. 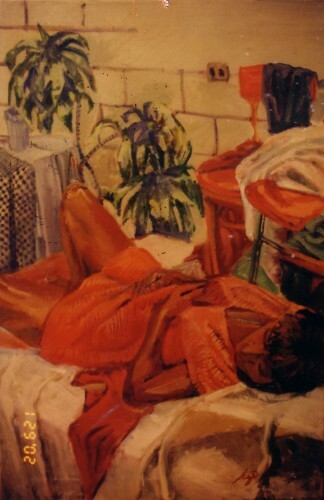 Ezra's roots stem from drawing and painting live models. Hair portraits is a series of works using the non-traditional medium of hair. In this series, he uses a person's hair to create a portrait of that person. This series brings up issues regarding the true self (human DNA) versus the image (ego). Lineage is a series of sculptural busts using technique and medium as a mirror into the soul of the artist. This series traces sculpture from teacher to student, even as the medium changes the sculptural techniques that are passed from generation to generation are still basically the same. 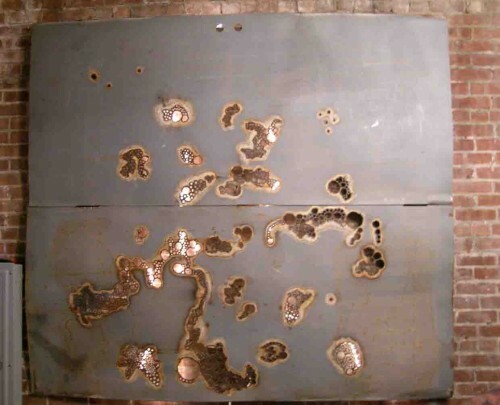 Ezra's newest series investigates nature's rawest form, the elements where he takes salvaged re-purposed materials such as oil tanks, fire doors and scrap metal to create sculptural form. Ezra primarily use an oxygen/acetylene welding rig to burn or cut holes into rusted objects creating the illusion of evaporating metal. The metal turns from a solid to a liquid, even burning off into gas. His sculptures play on complementary contradictions, creating feelings of lightness and majesty, coupled with the dark, rustic sensation of steel. This artwork emulates nature's organic elements, perpetually floating in a frozen moment of time and space. Certified assistant and substitute teacher; BFA in Studio Art with a minor in Art History. 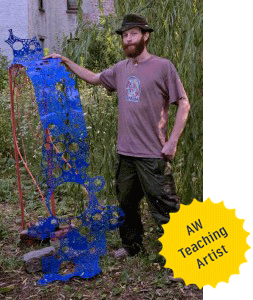 ArtsWestchester teaching artist. Ezra Silverman has been a professional painter and sculptor for six years. During this time, he has mastered and taught many techniques including drawing in graphite, charcoal, pastel, and marker; painting in watercolor, acrylic and oils; sculpting in clay, plaster, wood, metal and stone; mold making using clay, plaster and synthetic mold making materials. Ezra primarily works in sculpture mediums involving mold making and has created his own technique using human hair as an art medium to create portraits which capture the essence of one's eternal being. Ezra has been an assistant teacher for over three years and is enthused about getting back in front of the classroom. His most recent accomplishments are a show at the Cafeteria in New Paltz, NY, "Standing Water II," Rotary Park, Kingston, NY, "Standing Water I," Dred Scott Bird Sanctuary, Bronx, NY, winning first prize at the "New Directions '05" judged by Steven Evans of the Dia Art Foundation. During an anatomy workshop with middle school students at Yonkers Middle High School, students learned how to draw the human skeleton with a focus on facial structure. They learned all the bones in the body and how to draw them in their anatomical positions. They also learned to draw the face and made self- portraits as well as full body caricatures. During a video workshop at Westchester Manhattanville Magnet Academy, high school students learned to shoot using digital video camcorders as well as edit movies using Apple iMovie and Final Cut Pro. He helped students in all aspects, teaching them to act, direct, shoot, plan, write, edit, and add effects. The final pieces were five 15-minute movies produced by each group of 3-5 students. Ezra has also helped preschoolers at the Bounous Montessori School create a Surrealist mural. Children learned that pictures do not always represent reality and about the idea of chance. Through ArtsWestchester teaching residencies, Ezra has worked with 6th graders in School 9, Yonkers to create Egyptian-themed prints on plates from sketches and with 3rd graders who drew, sculpted, and painted habitats, ecosystems, plant and animal interdependence and food chains based on their research and studies. At Casimir Pulaski School, sixth graders analyzed, illustrated and created murals of characters and morals in Aesop's fables.